Author Mia March, on the question no reader has to ask! 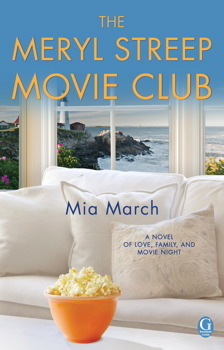 Mia March is the author of The Meryl Streep Movie Club and Finding Colin Firth, on sale now from Gallery Books! Very few readers have asked me why I wrote a novel called Finding Colin Firth–because it’s so danged obvious! Who doesn’t want a Colin Firth of her own? His range goes from hilariously funny (Mamma Mia!) to deeply moving (The King’s Speech) to just plain adorable (Love Actually and Bridget Jones’s Diary). He can play the bad guy (Tinker Tailor Soldier Spy), but my favorite Colin Firth roles are the ones where his honesty and forthrightness make me sigh. One of my favorite roles is Then She Found Me, starring Helen Hunt and Bette Midler where as a disheveled but devoted father he manages to sweep Helen Hunt off her feet. And even as a crazed soccer fan in Fever Pitch, the Colin Firth warmth and tenderness is always right at the surface. Colin Firth isn’t the everyman; he’s the epitome of a gentleman with that gorgeous British accent. 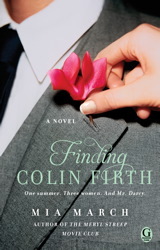 In Finding Colin Firth, my three main characters—22 year old Bea, hoping to connect with her birth mother; 38 year old Veronica, who bakes healing pies and becomes an extra on the Colin Firth film set to “hide” from her past; and Gemma, a 29 year old married journalist with a big secret—each wants to find him for very different reasons. If you have a chance to read the novel, I hope you reach the end with a satisfied “ahhh,” then make some popcorn and watch a Colin Firth movie. A super-charming, heartwarming novel about three women, connected in secret and surprising ways, who are in for a life-changing summer when rumor has it that actor Colin Firth is coming to their coastal Maine town to film a movie. Three women find unexpected answers, happiness, and the joys of true friendship, with Meryl Streep movies as their inspiration!